The baddest issues featuring the baddest models and content in any publication. Australian BADD Girl leaves everything at door, including her clothes, in her exclusive issue. Own your copy today! The gorgeous BADD Girl Drew Catherine goes Fully Uncensored in this Amazing Issue! Hayley Heidi Bray Exclusive! 100% Hayley Bray in this exclusive mega issue. If you love Hayley and/or BADD Girls then this is the issue for you! 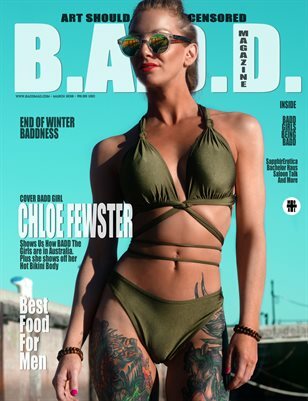 End of Winter BADDness (Chloe Fewster Cover) Spring takes on a new look and it's BADD! Own your copy today. We ship anywhere in the world. End of Winter BADDness (Dee Stacy Cover) Available now in Print & Digital! We hip anywhere in the world!